This book demolishes one of the last surviving myths about communist rule in China: that there was a “Golden Era” from the time of “liberation” in 1949 until the launch of the Great Leap Forward in 1958. For too many people outside China, the idea has prevailed for too long that this was a period when the Communist Party of China (CPC) ruled in a way that non-communists could respect. The Tragedy of Liberation achieves this with wave after wave of precision-targeted missiles of fact. Frank Dikötter is an exponent of the “shock and awe” school of historians. As in his previous book, Mao’s Great Famine, he has gathered a mass of evidence from official party archives in mainland China, which he has skilfully interwoven with accounts published elsewhere. Dikötter contends that from the very start, the CPC was unsure of its ability to control the nation it had conquered. So, it immediately used terror and violence in society at large, as Mao Zedong had been doing for internal control of the Party since the early 1940s. In the countryside, the vehicle for control through terror was the land reform program. In the cities, an alien environment for revolutionaries who had spent decades in rural bases, the Party used the mobilization of workers against bosses, mutual incrimination and persecution by businessmen and academics, and police raids of the kind all too familiar in the Soviet Union and Eastern Europe. The author does not claim that terror was the only weapon. He recognises that political dynamics also played a crucial role. “The history of communism in China is also a history of promises made and promises broken. . . . Mao achieved power by promising every disaffected group what they wanted most: land for the farmers, independence for all minorities, freedom for intellectuals, protection of private property for businessmen, higher living standards for the workers. . . . One by one these promises were broken.” 1 The Anti-Rightist Movement of 1957, in which 550,000 intellectuals were arrested or sent into internal exile, was the final act of betrayal. Dikötter is good at organizing his material. He has structured this book in four parts: Conquest, Take-Over, Regimentation, and Back Lash, which succeed each other chronologically. He shows how much the Conquest owed to Soviet military aid, and to the ruthless but brilliant conduct of the civil war by commanders like Lin Biao. In its Take-Over of rural China, the Communists could have carried out land reform peacefully, as Japan, Korea, and Taiwan did, buying land from larger landholders and redistributing it to landless peasants, without shedding a drop of blood. Instead, for political reasons, it chose to set the landless against the landed, and insisted on them using violence. As Dikötter puts it, “The pact between the Party and the poor was sealed in blood.”2 Deng Xiaoping himself reported, in some alarm, from the region under his control: “We kept on killing, and the masses kept on feeling more and more insecure.”3 Not all farmers complied immediately with the dictates of the Party. Dikötter cites much evidence of resistance, including armed resistance, which he found in the archives. Perhaps two million were killed; several times that number were sent to labor camps or subjected to surveillance by local militia. According to Dikötter, who has made special study of the prison regime in the Republican era, the Nationalists never had more than 90,000 prisoners. He recounts how, after the Communists launched their Great Terror in October 1950, the total number of prisoners rose quickly to one million. Conditions for prisoners were dire. Dikötter reminds us how China’s new rulers then isolated the country, lowering a “Bamboo Curtain” to cut it off from all but the Communist camp, just as the Iron Curtain cut Eastern Europe and the Soviet Union off from the West. Foreign-controlled businesses, schools, universities, and missionary societies that for a hundred years had served as agents of the modernization of China were closed down, and their foreign employees expelled. If the Party had allowed it, these institutions and individuals would have accepted the new regime, and worked with it, but they were not given that opportunity. The Communists believed that their Take-Over required them to replace the pursuit of mutual interest and a climate of good will with confrontation, distrust, and hostility. This new pattern of relations was reinforced when Mao threw China into war in Korea, in a bid to inflict a strategic defeat against the United States and its allies. After more than a decade of war, first against Japan then between Communists and Nationalists, most people longed for peace, but Dikötter shows that Mao’s highest priority was world revolution, with China leading in Asia. In Part Three, Regimentation, Dikötter describes the drives to remold minds, restructure the economy, and impose socialism in every sphere of life. His chapter on Thought Reform is not his strongest. He gives adequate attention to the Party’s strategies for asserting control over writers, educators, and the adherents of major religions. He describes vividly how young idealists went to the Communists’ base area of Yan’an “full of idealism, embracing liberty, equality, democracy, and other liberal values”8 and were quickly disillusioned when they found a rigid hierarchy, dogmatism, indoctrination, mutual denunciation, interrogation, and conformity enforced by torture. He acknowledges that many young people engaged in re-education with relish, and some older people too “looked past the misery of the present to see a radiant future beckoning ahead” believing “that they were participating in a historic process of transformation.”9 But his coverage of the totalitarian apparatus used to brainwash (Mao liked this term) society as a whole is rather thin. Chastened by the famine in the Ukraine in the 1930s, Stalin had written to his Chinese comrades in 1950 advising them to limit the targets of land reform to large landowners, and to leave the economy of the rich peasants intact. Unlike the Soviet Union, and contrary to communist propaganda, there were few large landowners in China, but for political reasons the Party ignored Stalin’s advice, and set poor peasants against farmers who owned a few acres more than the average. The whole rural economy was now paying the price. And this was a revolution carried out in the name of China’s peasants. Farmers attempted to leave the countryside for the towns, which the regime was careful to protect from famine lest they rise in revolt. Again, the Party’s answer was not to restore freedom, but to restrict it further, taking two giant steps forward in the Regimentation of society: compulsory household registration and rationing. Both were imposed in 1955, restricting freedom of residence and movement, restrictions unprecedented in China’s peace-time history. It was not only in agriculture that the Party’s policies were failing. Dikötter has found surveys, quietly filed away in the archives, which reveal “a picture of chronic malnutrition and poor health,” in cities as well as rural areas. Health care was not free, and workers’ incomes were falling, not rising. “The Bureau of Labour, which studied hundreds of factories in 1956, concluded that ‘over the past few years the real income of workers has followed a downward trend’.” 13 When anti-communist revolts broke out in Poland and Hungary, China’s leaders took it as a warning that they might face similar challenges. This is the story of Dikötter’s Part Four: Backlash. How should the Party forestall the challenges? In the economic sphere, most senior officials under Mao favoured a limited reversal of collectivization, and some increase in market freedoms; in politics, they followed the lead of the Soviet Union in emphasizing collective leadership over personality cults such as those which had given supreme power to Stalin and Mao. Dikötter shows how Mao tried to outflank his subordinates by posing as a champion of a more humane form of socialism and freedom of speech, with his call “to let a hundred flowers bloom, and let a hundred schools contend.”14 His subordinates feared this would end in tears, and Mao soon saw that he had unleashed a nationwide movement to make fundamental criticisms of communist rule. He pretended that his objective had been to lure snakes from their holes. The Anti-Rightist campaign ensured that China’s intellectuals would never again trust the Party in Mao’s lifetime, and would give it only grudging, cautious obedience. The Party had forestalled a Hungarian-style uprising, but at a heavy cost. Mao’s self-confidence was undented. By the end of 1957 he would launch the Great Leap Forward, the boldest adventure of the Chinese revolution, its greatest disaster and the subject of Dikötter’s Mao’s Great Famine, already published. In boxing terms, Dikötter is a middle-weight. More agile than a heavy-weight, he still packs a mighty punch. 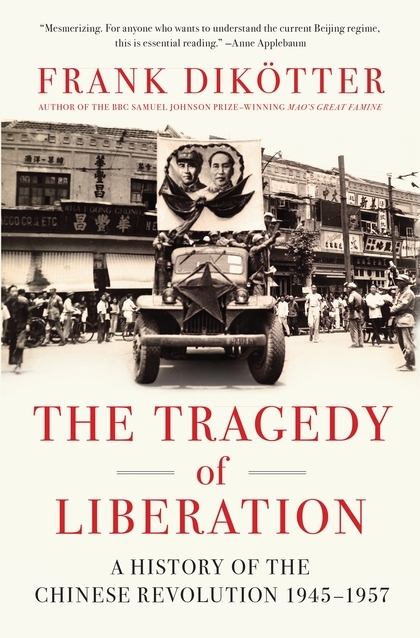 His muscular writing is not just a matter of style: it reflects vigor of thought, and courage in challenging the myths that have prevailed in the field of China studies for half a century and exposing truths about the history of a regime that is extremely skilled at masking them. Too many China historians tiptoe around comparisons with pre-1949 China, but not Dikötter, who makes bold comparisons, ones that the CPC hates. Too many tiptoe around comparisons with the market economies of East Asia, but not Dikötter. He goes to the heart of the issues, as in the judgment quoted above about “the history of promises made and promises broken.”15 He allows Party leaders to condemn themselves by their own utterances. He is good on social dynamics, as when he is describing land reform: the falsehoods, the destruction of old relationships, the promotion of violent and brutal people, and the exaltation of violence and hatred. He evokes the moral consequences of the revolution, consequences that still make themselves felt today and will blight China far into the future. (As the Bible teaches, “The iniquity of the fathers shall be visited upon the children, and upon the children's children, unto the third and to the fourth generation.” Exodus 34:7). The Tragedy of Liberation is the second volume to be published in Dikötter’s People’s Trilogy about the People’s Republic, which is truly a people’s trilogy. He uses his rich harvest of findings from Party archives to illustrate the impact of the revolution on the lives of a vast range of individuals. He sets their hopes, disillusion, and sufferings in the wider political and social context which he establishes concisely and cogently. He interweaves the published testimony of others, outstanding intellectuals like Wu Ningkun, students like Dan Ling, and businessmen like Robert Loh. Although Dikötter is a scholar by training and profession, this trilogy is not an academic exercise designed to advance a career in the groves of academe: it is a great project driven by empathy for fellow human beings, who happen to be Chinese, and by determination to get at the truth about one of the most important movements in the history of the 20th and 21st centuries, which happens to be taking place in China. In celebrating it, let us note four things: it would not have been possible without the opening of archives in China, it is being carried out from a base in Hong Kong, it is being published in the UK, and it is officially banned in mainland China. That ban is just one sign that the insecurity that the Party leaders felt in 1949 about their ability to control China still troubles their successors today. Roger Garside served as a British diplomat in China during and immediately after the Cultural Revolution. He is the author of Coming Alive: China after Mao, published in 1981. 2009-1: China: A Plaything of the Western Mind?